Porcelain tile consistently ranks as a preferred flooring choice among homeowners, partly due to its beauty—the material comes in a veritable rainbow of hues—and partly due to its stain- and moisture-resistance. Though it loses luster over time, anyone can learn how to clean porcelain tile and restore its original shine. Clean porcelain tile regularly, as often as two times per week, to keep it in tip-top condition. Simply sweep with a soft-bristle broom before vacuuming (with the brush attachment). Then, once a month, mix 1/4 cup white vinegar with two gallons of water (or purchase one of the many suitable commercial cleansers), applying the solution to the floor with a sponge mop. Rinse with plain water, then dry the surface completely with a clean towel or a microfiber cloth. Vacuum and sweep the area thoroughly to remove dust and dirt. Taking one section at a time (two or four feet square), saturate the tile surface with a vinegar-and-water mixture or a commercial cleanser, such as Black Diamond Marble & Tile Floor Cleaner (view on Amazon). Allow the cleanser to soak into the tile for five to ten minutes, but do not allow it to dry. Scrub stained areas with a soft-bristle brush. Wipe away the dirty cleaning solution and rinse the area with hot water. Dry the tile with a clean towel or a microfiber cloth. Sweep and vacuum debris and dirt, then go over the area with a dry dust mop. Now use a hot water-dampened mop, never allowing moisture to puddle or pool on the tile. Loosen heavier soil with a soft nylon-bristle brush (or an old toothbrush). For stains, use a vinegar-and-water mixture (or a commercial cleanser diluted to half strength). Mop with your chosen cleanser, mopping again with hot water before the cleanser dries. Dry the tile surface with a clean towel or a microfiber cloth, being sure to rub out any water spots. Once dry, buff the clean porcelain tile to a high shine with a piece of cheesecloth. Sweep the area twice with a soft-bristle broom, first in the direction of the tile, then on a diagonal. Vacuum to remove all dirt. Saturate the tile with a vinegar-and-water solution, allowing it to soak for five to ten minutes. Scrub the floor with a soft-bristle brush, again working in two directions. Rinse the floor with hot water in order to thoroughly remove the cleaning solution. Go over the clean porcelain tile floor with a damp mop. Dry with a clean towel or a microfiber cloth. Never use a product containing ammonia or bleach (or any type of acid-based cleanser); these can alter the tile color and/or stain the grout. Never use oil-based detergents or wax cleaners. On unglazed porcelain, never use any cleaners that contain dye or coloring. Never use steel wool to clean porcelain tile—small particles of steel can become embedded in the tile and grout, eventually causing rust stains. Never use hard bristles or scrub brushes, as they can scratch the tile surface. 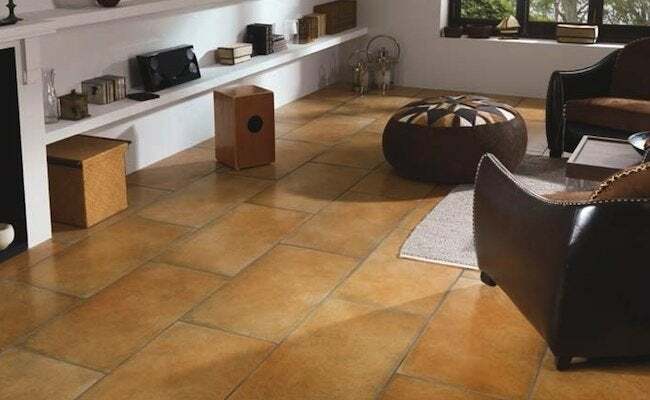 Regular cleaning and polishing with a soft cotton or microfiber cloth will ensure that porcelain tile retains its “like new” shine for many years.